The double doors slide open before me. PSSSSHT. It’s like being on the Enterprise. I’m Kirk! I’m Doctor Kirk! I slide past the beautifully-arranged plants and into the hospital in my Two Point County-issue medical socks, take in a huge breath and admire the new space before me. 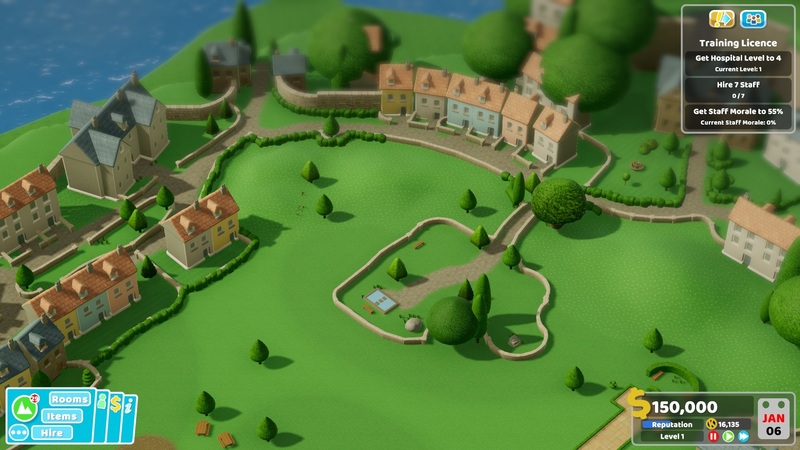 Flottering can be best described as a picturesque slightly-inland, slightly-seaside village. Alexander the Great wept when he had no more lands to conquer, but if he’d known about Flottering he’d have been straight over with a giant smile on his face, for this is a wonderful land indeed. There are some lovely houses around Flottering – some I would estimate sell for a cool mil. And there are some lovely, incredibly naive patients to diagnose. What’s more, the Two Point Health Ministry has promised me something very special. If I can demonstrate my commitment to staff wellbeing here, I’ll be granted a proper training licence. 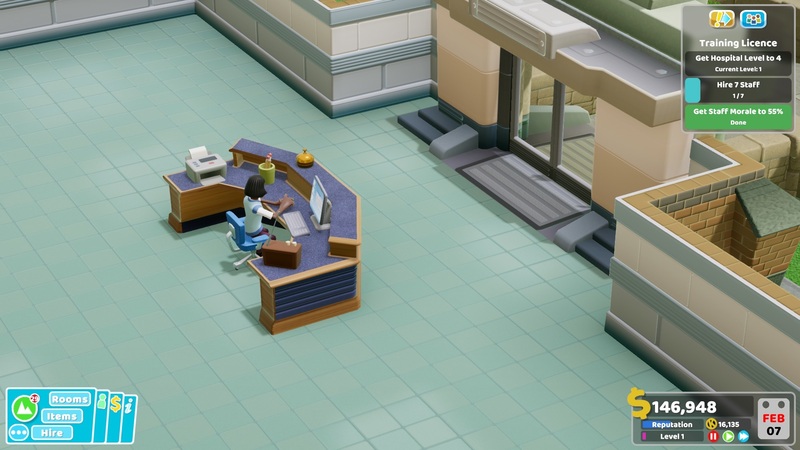 My goals are clear: achieve a level four hospital, hire 7 staff and keep their morale high. This won’t be easy; I’m a terrible manager (and I prefer fire extinguishers and reception desks to people), but I’m here to learn and I’ll do it with gusto. Hire 1 sorted – Candica Radical. I like the cut of her jib. She’s an administrator with style, and a cool name, so I’m absolutely on board. Before long, I have a GP’s office with hire number 2 on board. I have a calling card when it comes to laying out GP’s offices. They know me in Two Point County as Hospital Admin Twolamps. 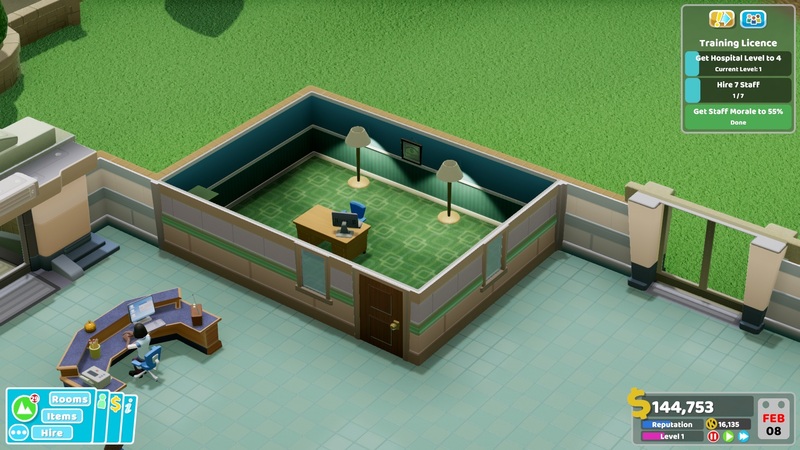 That’s because I always flank my GP’s desks with two lamps. It’s an odd habit, but you can’t overstate the value of good lighting, and it picks out the details of the gold foil on the certificate on the wall beautifully. But what’s this? While I’ve been spending time arranging my room, I’ve let a queue build up outside the doctor’s office and… oh my. 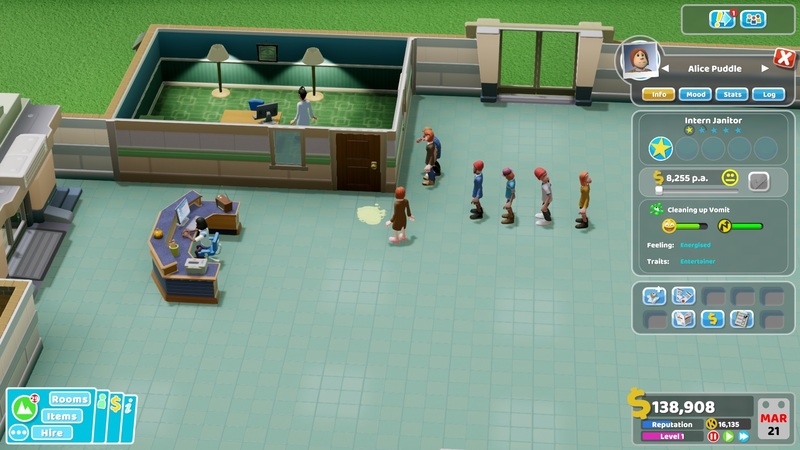 Someone has VOMITED on the floor of my precious hospital. 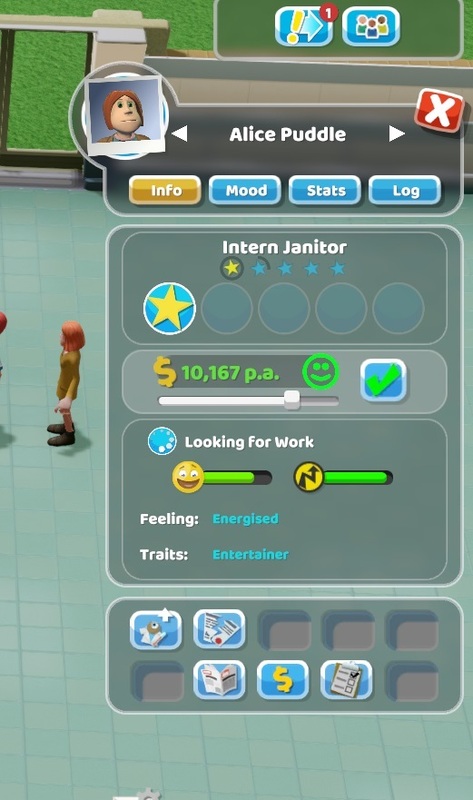 I recruit a janitor to deal with the problem – appropriately named Alice Puddle. I monitor her performance. If she can deal well with this rancid human effluent, I’ll consider her for a pay rise. Of course, she takes to it like a duck to… uh, water… and clears up the vile chunks in a matter of seconds. I add 2k to her salary right away and she’s delighted. Pretty soon I have a nice little enterprise going. 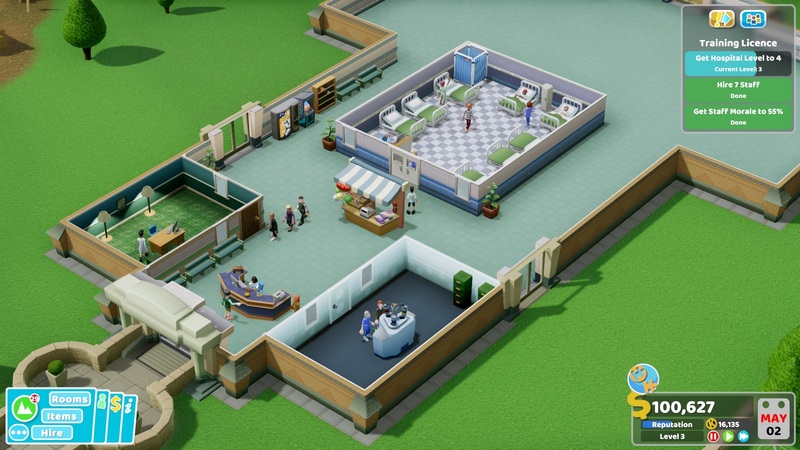 I have a reception, a GP’s office, a pharmacy, a waiting area, gift shop, a ward, and a bunch of entertainment for patients. That’s got me up to the required 7 staff and I’ve also currently got high morale in my hospital. But now the real challenge begins. 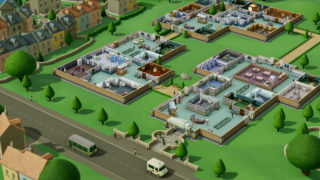 I’ll have to ensure that my staff STAY happy while I get my hospital up to Level 4. If I succeed, there’s another world ahead of me. Another land to conquer. One where we may encounter sufferers of Jest Infection, a terrible ailment which converts the sufferer into a clown. You may have met one or two of them in the real world. 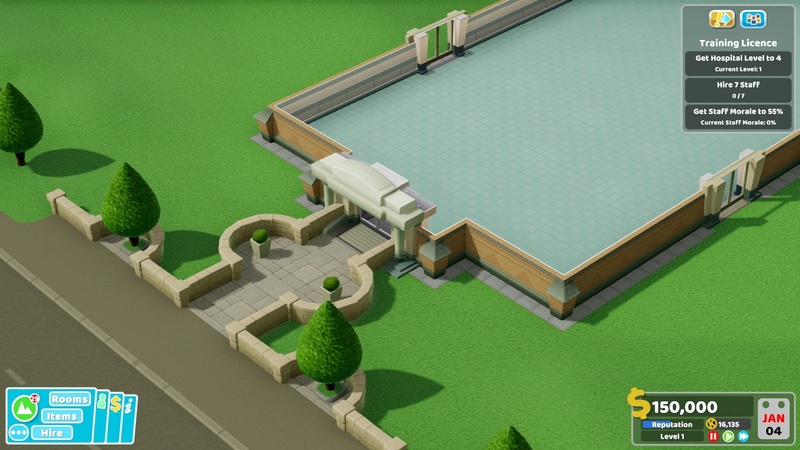 As for what I do next in Flottering: probably toilets and a staff room. “That can wait”, I mutter to myself as I slide up to a Sonic Mania coin-op in those medical socks.